An LGBTQ delegation from Japan met with Okaeri representatives (from left) Harold Kameya, Alex H. Fukui, traci ishigo; (front and center) Ellen Kameya, Marsha Aizumi; (right) Rev. Mark Nakagawa. Since the first Okaeri conference was held two years ago at the Japanese American National Museum, a lot has happened in the Nikkei LGBTQ (lesbian, gay, bisexual, transgender, queer and/or questioning) community. 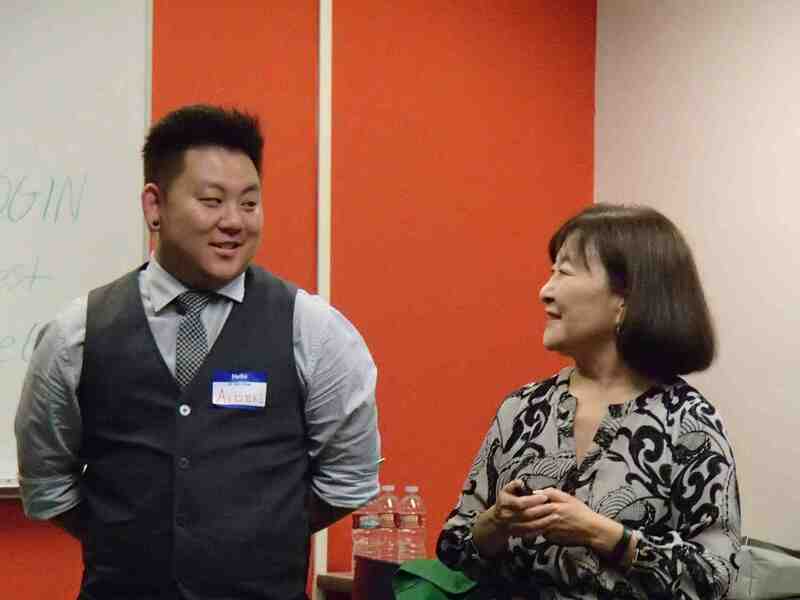 Aiden and Marsha Aizumi speaking at the API LGBTQ Gathering in Seattle. “Having a gay person ask about working with her mother. Sharing my story of the importance of patience and acceptance of a mother’s journey and later hearing that her conversation with her mom went to well, because of her patience towards her mom. She said she felt so good about their interaction. “Having some of my family at the event and finding out afterwards how much they enjoyed the event and grew in understanding and awareness about the LGBTQ community. They are a sponsor for Okaeri 2016. 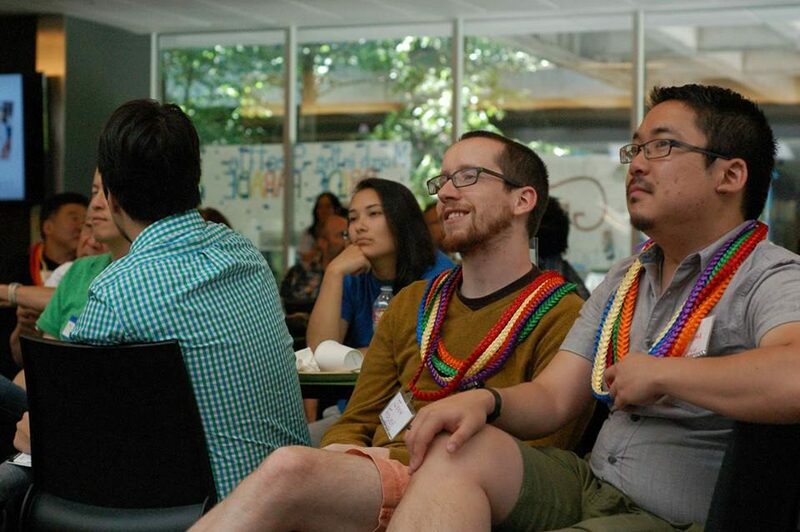 Family: An API LGBTQ Gathering was held in Seattle in June 2015, organized by two Seattle JACL members who had attended Okaeri. In turn, the lead organizer of APIQ Homecoming, held last April in Sacramento, had attended the Seattle event. Glenn and Karen Murakami attended Okaeri and started a group called Open Arms at Faith United Methodist Church in Torrance, and another Okaeri participant started a monthly gathering in Chicago. A delegation from Japan met with Okaeri organizers. Earlier this year, a Japanese mother from New York met with some of the LGBTQ organizers in Japan that were part of the delegation. Okaeri is looking to partner with the U.S. State Department and the National Queer API Alliance to do family acceptance workshops in Asia next year, and has been approached to translate a video about Okaeri into Japanese. The Korean LGBTQ community heard about Okaeri and has organized a national gathering to be held in Virginia this weekend. Participants in the Seattle API LGBTQ conference. “As a result of the interest in family acceptance, two mothers from Okaeri have been lead supporters in a National Family Acceptance Campaign that has been booked in 12 cities in 2016 working with the National Queer API Alliance,” Aizumi added. The keynote speakers at Okaeri will be Rep. Mike Honda (D-San Jose), his daughter Michelle and his transgender granddaughter Malisa. Michelle Honda-Phillips was also a speaker at Tadaima. Okaeri begins Friday with a reception at 7 p.m. and the all-day conference starts Saturday at 9 a.m. JANM is located at 100 N. Central Ave. (at First Street) in Little Tokyo. Registration is $20 to $35 but no one will be turned away for lack of funds. For more information, visit www.okaeri-losangeles.org.